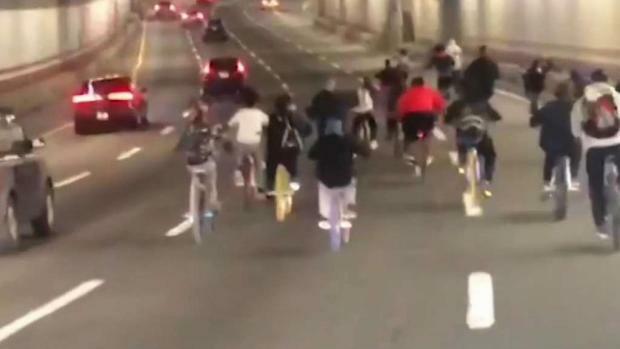 A group of teens biked through the O'Neil Tunnel in Boston. 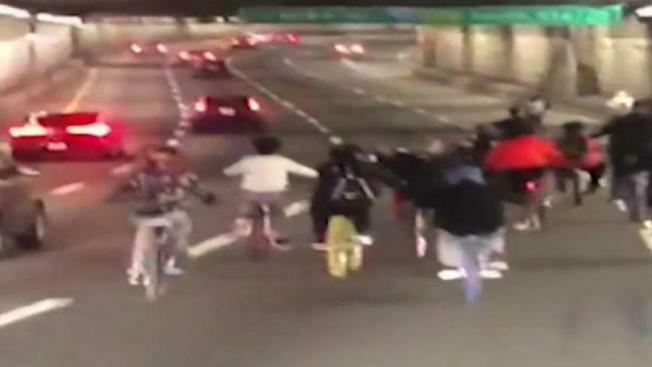 Massachusetts State Police are investigating after an estimated 30 teenagers rode bicycles through the O'Neill Tunnel in Boston Saturday night while weaving in and out of traffic and popping wheelies in front of moving vehicles. The incident, which was captured on cell phone video at about 6:30 p.m., started after the teen entered the tunnel through the Leverett Connector. "Oh my gosh, people! That's horrific! No, that's horrific! No, that's really bad!" said Carol Thomas, reacting to the video. Thomas, who rides a bike around Boston every day, said the stunt wasn't too smart. Massachusetts State Police are investigating after an estimated 30 teenagers rode bicyles through the O'Neill Tunnel in Boston Saturday night. "I'm from the New York area, and if some person — I would call them a moron — decides to bike through the Lincoln Tunnel, I would say they need to bike straight to Bellevue. It's a mental institution." Police said it all ended when they forced the group off the South Station exit, where they took off. They decided not to chase them, citing safety concerns. "That is dangerous," said Alejandro Lizano, who also bikes around the city daily. "They are trying to feel like bad people, you know? Like, 'Oh my God! I am so cool doing this,' but they are not thinking of the issues of that." It's unclear whether the teens will face charges.